The Leroy Room is designed to allow you to custom-tailor every aspect of your event, ensuring that your guests have an experience that exceeds their expectations. Guests enter the Leroy Room through the receiving area of our iconic Bleecker Street store. They're then transported to an elegant subterranean fortress complete with a cocktail reception space and two separate rooms that are modular in design for your party experience. *All events are subject to 20% administrative fees as well as New York State tax at 8.875%. A guided tasting stimulates both the palate and the mind, encapsulating the full Murray’s experience. Our tastings take place in our former affinage room, where you’ll learn about the history of cheese and beverage by tasting through various styles of each with our certified experts. We’ve listed our most popular tastings below, and have a multitude more available to appeal to your group’s specific interests. Modeled after our time-tested, introductory Cheese 101 class, our knowledgeable mongers take you on a gustatory tour across the various styles and families of cheese. Take things to the next level by incorporating the wonderful world of wine pairing into your cheese tasting. This casual course showcases the principles of matching the right cheeses with the right vintages. Accompanying your evening with an educational component is a perfect way to bring a memorable element into your celebration. But why stop at tasting? 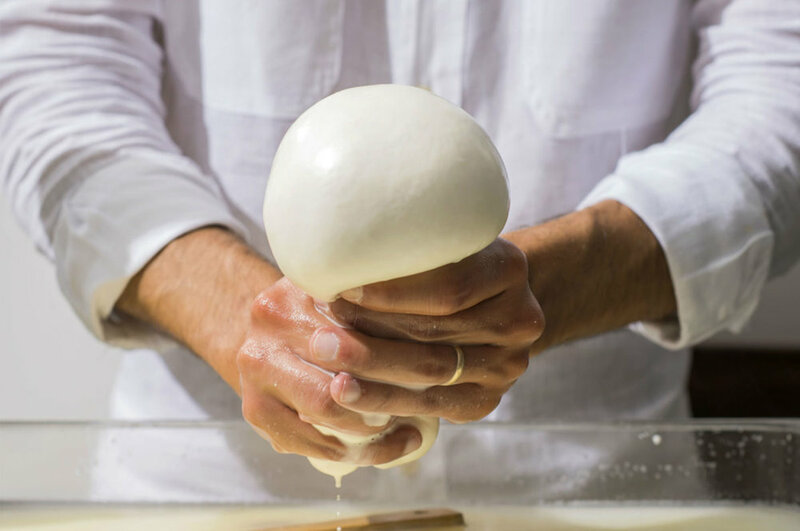 We invite you and your guests to get hands-on, as our cheesemongers guide you through the traditional process of making fresh mozzarella. Cheese Cornucopia Table (pictured above) pricing available and given upon request. *Please see our attached menu for our seasonal offerings. Welcome your guests to settle in, snack, and share a drink before the main event with any choice of three canapes from a list of twelve seasonally-rotating options. From towers built of your favorite cheeses to extensive bounties of fresh vegetables, we will create a spread of hors d’oeuvres curated to your tastes and replenished to suit the appetite of your guests. Our Executive Chef, David Elkins, will customize those first bites with our Interactive Stations. Whether it’s fresh pastas prepared in front of you with an array of sauces and accoutrements or bubbling layers of Raclette smothered over fresh baguette and cured meats, these stations up the wow-factor to a whole new level. *We welcome customization to any menu item or course. *Please see our attached menu with explanation of our tier offerings and seasonal selections. Enjoy a selection of Stumptown coffees & unique teas.